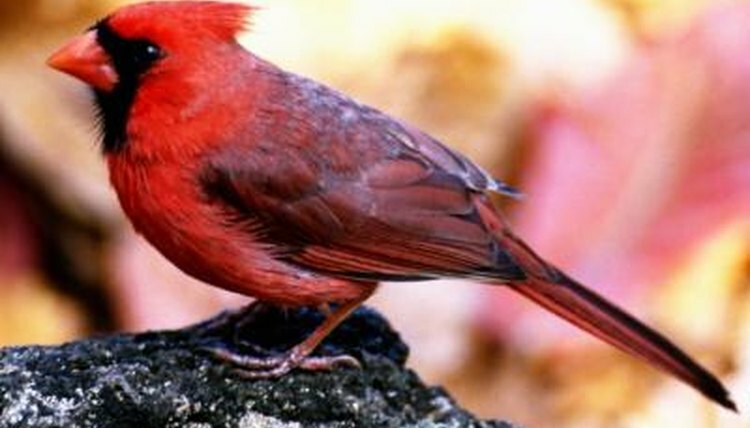 Cardinals, aka northern cardinals, are distinctive birds with red plumage, the males brighter than the females. They can be found across eastern and central North America, including southern Canada and parts of Central America. Although they mainly eat plant foods, they also consume insects and some other foods, so they're considered to be omnivores. Fruits, seeds and other plant matter accounts for the majority of adult cardinals' diets. Fruits they eat include wild grapes, blackberries, raspberries and dogwood fruits. They commonly come across seeds to eat, such as those from pine trees, thistle, sorrel and various grasses. They've also been known to eat grains and buds from trees such as chokecherry and elm. Adult cardinals eat some insects and other meaty foods when opportunity arises. They're known to consume cicadas, beetles, flies, crickets, moths, spiders, centipedes and larvae such as caterpillars. Reports suggest they'll eat small carrion if other food is scarce. Insects and other such foods make up only roughly 10 percent of their diets. Unlike adults of their species, cardinal chicks live on a diet consisting almost exclusively of insects, fed by their parents. At the peak of their growth, cardinal parents have to feed their chicks eight times per hour. Once the chicks can manage grubs and larger insects, they can decrease this frequency to three to four times per hour. Cardinal parents have such a strong natural drive to feed that they've been seen feeding chicks belonging to other birds and even larger fish in ponds. If you'd like to see more cardinals in your yard, the best thing you can do is feed them. They prefer to feed on the ground but will eat from platform feeders, which is a safer option if you get cats or other potential predators in your garden. They especially like to eat millet, black oil sunflower seeds, cracked corn, peanut butter, safflower seeds, berries and mealworms. Adding water source -- such as a birdbath -- to your yard is also beneficial.